The labor group Partido Manggagawa (PM) slammed the administration of President Rodrigo Duterte for the persistence of endo, rising inflation and the threat of unemployment. PM called on the government to drop charter change and instead prioritize regular jobs and a living wage. 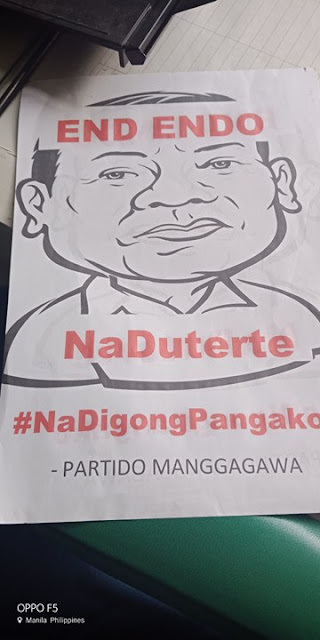 “Ang end endo ay naDuterte. Isa itong naDigong pangako. Workers are bearing the brunt of the broken promises of the administration. Malacanang’s belated announcement that an EO may be signed today is obviously a last minute maneuver. We’ll judge the EO when indeed one is signed. Contractuals do not become regular just because of a press release. Gawa hindi salita,” exclaimed Dennis Derige, PM-Cebu spokesperson. PM joined the labor coalition Nagkaisa and the Cebu Citizen’s Assembly in the rally that gathered at the Sto. Rosario Church before marching to downtown Colon. PM participated in the labor unity rally of Nagkaisa and KMU in Manila that was a massive indignation mobilization against President Duterte’s failure to end contractualization. PM chapters in Bacolod, Davao and General Santos also mobilized for the nationwide Labor Day commemoration. In Bacolod, PM and KMU contingents had a salubungan in the morning at the Fountain of Justice at the old City Hall. PM’s main rally was held in the afternoon after a mass meeting in the morning. In Davao, Nagkaisa and KMU assembled in the morning at Orcullo Park and then marched around the city. PM warned of rising unemployment with a call from President Rodrigo Duterte for Kuwaiti OFW’s to come home, the six-month closure of Boracay and the impact of TRAIN on the economy. “President Duterte is again making a personal promise, this time of providing jobs for OFW’s. But he has yet to deliver on his campaign promise two years go to end endo the moment he assumes the presidency. Mr. President, not another broken promise,” averred Derige. The group is concerned as well with the rising inflation together with worsening unemployment. Economists predict that inflation will hit 4.6% this April. Inflation has steadily climbed every month from just 2.9% last December. “Even as jobs remained contractual not regular, wages are being eroded by the escalation of prices. Where is the iron fist to control prices? Government is sleeping on the job!,” Derige argued. He insisted that the fight against contractualization is not over as the group vowed to organize and mobilize workers in the continuing campaign to end endo.